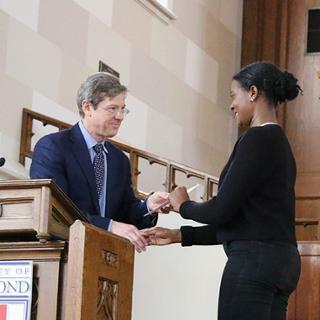 Recent graduate's interdisciplinary education and fascination with antiquity inspired her to create a 2-D model of ancient Rome. Beneath Rome’s tourist-filled sidewalks, under the noisy scooters and exhaust-spewing taxis on the Via dei Fori Imperiali, rest the artifacts of the ancient Imperial Fora. 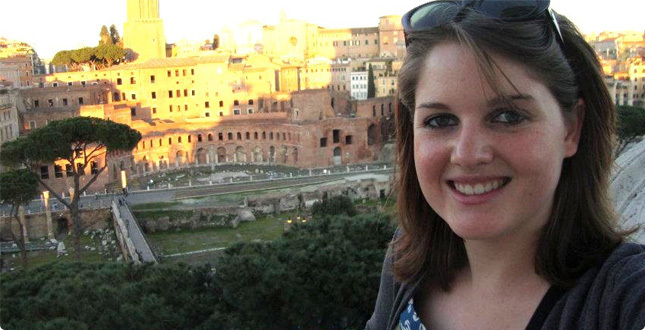 Samantha Frandsen, ’13, of Reno, Nev., investigated these artifacts while studying abroad in Italy in spring 2012 with IES Abroad, a UR-approved affiliate program. This heady combination of study coalesced in Rome. In her first week studying abroad, she and friends managed to lose themselves in the city’s windy streets. Trying to gain her bearings, Frandsen said she took a careful look at a building near the group and slowly realized that the wall seemed familiar. She had seen it in a textbook. She told the others, “Guys, this is the rear side of the Pantheon!” They had stumbled upon one of Western Europe’s greatest landmarks and one of Frandsen’s favorite buildings of the ancient world. Frandsen’s excitement for the architecture of Rome and sharing it with others grew. When her family visited her, she quizzed them on Roman history and demanded they answer at least one question correctly before she would show them the best gelato shops. The site visits for her class, The Archaeology of Rome–The Former Urbis, brought her to the Imperial Fora dig. Built between 46 B.C. and 113 A.D., the Imperial Fora once contained massive structures and plazas central to commerce, government, culture, and education in the ancient Roman Republic and Empire. Frandsen said that only after standing in the remains of the Imperial Fora did she fully grasp the complex archaeology she had studied in a Richmond classroom. Her experiences while studying abroad prompted Frandsen to take her interdisciplinary education further when she returned to Richmond. As part of an independent study course, she created a 2-D map of the ancient civic center to help other students understand the structure’s layout. Supported by mentors in the Geography and the Environment department and Classical Studies department, Frandsen incorporated Global Information Systems (GIS) techniques with the Roman archaeological dig to build the interactive map. She spent hours in the Spatial Analysis Laboratory at the Carole Weinstein International Center using the layering functions of GIS software, content pop-ups, artist renderings, and satellite photos of modern Rome to illustrate the history, function, and design of each building in the Imperial Fora. Dr. Elizabeth Baughan, associate professor of Classics and Archaeology, and Frandsen’s mentor, plans to use the model when she teaches Roman Art and Archaeology (Classics 302). “What is really nice about the project is that it can show how the Imperial Fora developed over time, with emperors building upon what their predecessors had done but still creating innovative spaces for the growing city of Rome,” Baughan said. 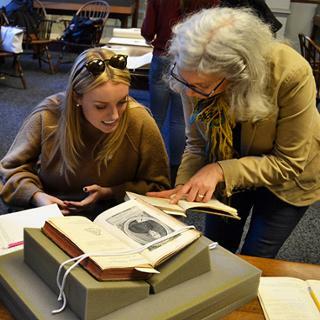 While Frandsen leaves behind her own remnants of history for future Classics students to explore, she plans to continue educating others off campus after graduation. 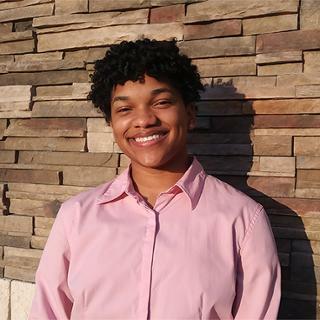 She will teach physics for two years at the Abraham Lincoln Visual and Performing Arts Magnet School in San Jose, Calif., as a corps member of Teach for America. Photo: The Roman sun illuminates the city surrounding the Forum of Trajan and other Imperial Fora behind Samantha Frandsen, who stands atop the monument of Vittorio Emanuele II.